I have been loving Red Krill Oil over the past few months. Krill Oil is a concentrated source of Omega-3 oil, which has great benefits in terms of brain function, heart health and vision. Krill Oil also contains Omega 9 which contributes to maintaining a normal level of metabolism and aids the body in hormone regulation. 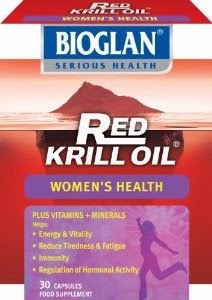 The particular supplement that I take is 'Bioglan Red Krill Oil Women's Health'. It contains added Iron and B6 which are great for energy, with B6 aiding in maintaining normal hormonal activity. Zinc is also contained which helps to ensure that our hair, skin and nails are healthy. Additionally, Zinc helps us to sustain a healthy immune system. Before taking Red Krill Oil, I took a Multivitamin with Iron, Cod Liver Oil, Sea Kelp and Evening Primrose Oil. I now only need to take my Multivitamin (without Iron), Red Krill Oil and Sea Kelp. I am getting enough essential fatty acids from the Krill Oil, so I am able to omit the Cod Liver Oil and the Evening Primrose Oil. Taking Red Krill Oil has greatly simplified my supplement intake. I feel great - totally mentally alert and energised! I recommend trying Krill Oil out, I am loving it. Hopefully I will see some long-term effects too, perhaps in terms of improved vision.